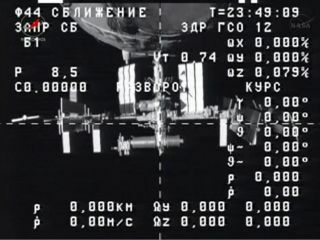 A camera aboard Russia's unmanned Progress 50 cargo ship captured this view of the International Space Station just after undocking on July 25, 2013. The cargo ship hauled trash and unneeded gear, including the space station's first treadmill, to be disposed of by burning up in Earth's atmosphere. An unmanned Russian cargo ship filled with trash and an astronaut treadmill cast off from the International Space Station Thursday (July 25) to make way for a fresh delivery set to launch to the orbiting lab this weekend. The robotic Progress 50 spacecraft undocked from the space station at 4:43 p.m. EDT (2043 GMT) to end its months-long resupply mission. The spacecraft was expected to begin a fiery plunge back to Earth at 7:53 p.m. EDT (2353 GMT) and ultimately burn up in the atmosphere over the Pacific Ocean, NASA officials said. According to a NASA spokesman, among the trash and unneeded gear on the Progress 50 spacecraft was the Treadmill Vibration Isolation System — the space treadmill used by astronauts to keep fit during the months of weightlessness living on the station. The treadmill had been used on the station since the first crew took up residence in November 2000. The departure of Progress 50 from the International Space Station sets the stage for the launch of a new Russian cargo ship, the robotic Progress 52 (52P) spacecraft, from the Central Asian spaceport of Kazakhstan on Saturday (July 27). That new cargo ship is scheduled to launch toward the space station at 4:45 p.m. EDT (2045 GMT) and arrive just six hours later during its express delivery flight. You can watch the launch of Russia's Progress 52 spacecraft on SPACE.com, courtesy of NASA TV. Launch coverage begins Saturday at 4:30 p.m. EDT (2030 GMT). "That 52P will be delivering just a little over 5,600 pounds of supplies to the International Space Station," a NASA spokesman said during undocking commentary. Progress cargo ships are disposable spacecraft composed of three modules, much like Russia's crew-carrying Soyuz space capsules. But instead of the central crew capsule on Soyuz vehicles, Progress vehicles have a propellant module laden with fuel for space station maneuvers. Progress 50 launched toward the space station in February and docked to the orbiting lab's Earth-facing Pirs docking compartment. The Progress 52 spacecraft will dock at the same Pirs port on Saturday night at 10:26 p.m. EDT (0226 July 28 GMT), NASA officials said.